Looking for things to do in London at Christmas? 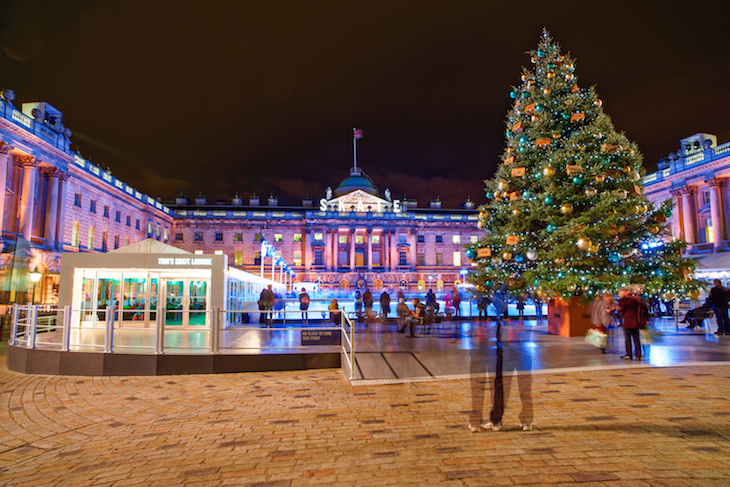 Whether you live here or are visiting the capital over the holiday period, it's a great place to get festive, with plenty of different events taking place, from ice rinks to Christmas markets, Christmas lights and festive food and drink. And that's before we even think about New Year's Eve. We'll be adding more details for Christmas 2018 closer to the time, so keep checking back. 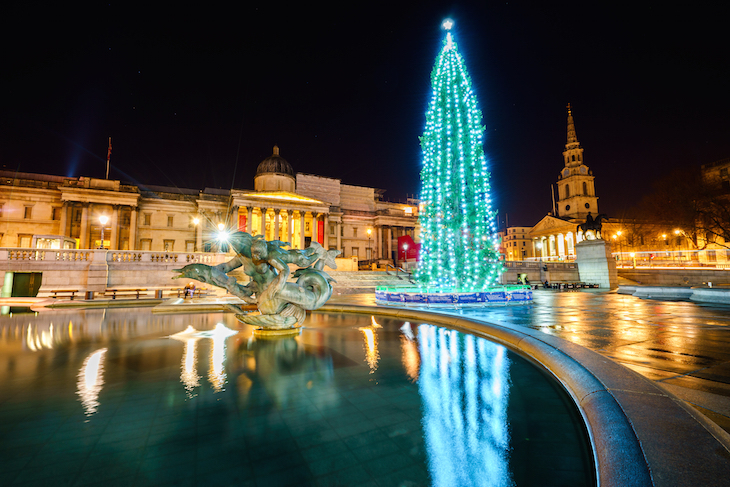 Trafalgar Square is where you'll find the huge Christmas tree, donated to the people of Britain by the city of Oslo each year, and it's lit up from early December. The decorations themselves usually cause some debate, but on weekday evening and weekend afternoons lots of different groups get involved in carol singing beneath the tree, making it a very festive place to be. Plenty of charities and organisations look for volunteers to help both in the run-up to Christmas and on Christmas Day itself. Have a look at what's going on and where you can volunteer in London over Christmas 2018. If juggernauts are more your thing, the Coca-Cola truck is coming to London as part of its UK tour — and while we're on all things commercialised, see if our predictions about the 2018 John Lewis advert were correct. Oh, and one more thing. Santa's arrived early this year... he's already roaming the capital, as documented in this charming Instagram account. Follow it to bring some festive sparkle into your life. Looking for things to do on Christmas Eve? Here's a guide to what's going on over Christmas Eve 2018. Bear in mind that many shops, restaurants, cafes, bars, museums and galleries may close earlier than usual on Christmas Eve. London's Christmas light switch-ons begin in November — here's what's being switched on when this year. It began with the Oxford Street Christmas lights switch-on on 6 November. We've rounded up some of the best photos of this year's lights (and if Christmas trees are your thing, we've got London's loveliest here). We have to say though, this may well be our favourite 2018 Christmas light display. 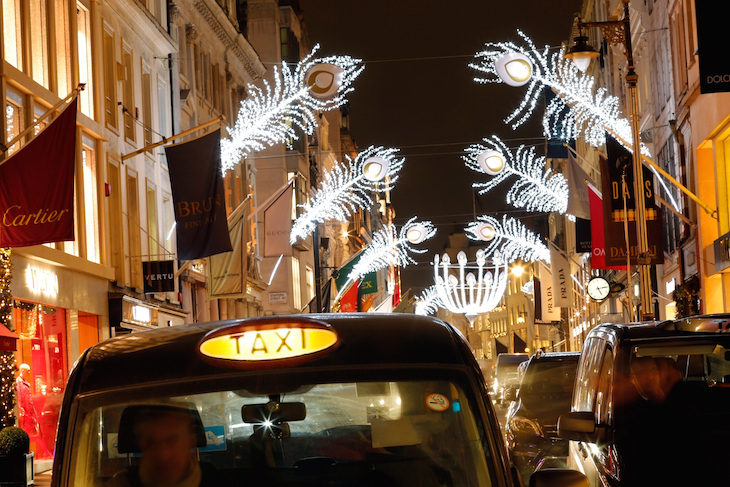 If that's whetted your appetite, here's our guide to seeing London's Christmas lights by bus. Lots of Christmas markets, festive fairs and yuletide festivals proliferate throughout the capital in December to help make Christmas shopping jolly. Here's our guide to London's 2018 Christmas markets and fairs. London's got a wealth of department stores to choose from — find out which is our favourite. Selfridges opened its Christmas department in the August heatwave, and the other stores soon followed suit — including grottos. 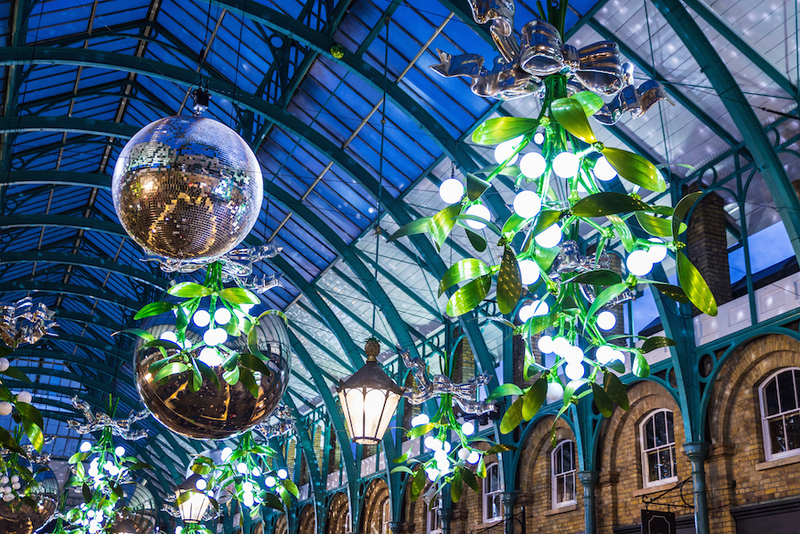 If it's decorations you're after, you'll find plenty of tree hangers that pay homage to this great city. In fact, we found so many, we mapped them. CHRISTMAS FILMS: Plenty of places screen festive classics in the run-up to the big day. Find out where to get your dose of Elf, Love Actually or It's A Wonderful Life with our guide to Christmas 2018 movie screenings — or treat yourself to a special anniversary screening of The Snowman. WINTER WONDERLAND 2018: Winter Wonderland opens in Hyde Park (22 November 2018-6 January 2019) featuring a huge fun fair, ice rink, games, Christmas market and seasonal food and drink. There are special screenings of The Snowman for Christmas 2018. It's free to enter but gets very busy and everything you do inside will cost you apart from walking around and soaking up the atmosphere. We spoke to some visitors to find out what the attraction is. ICE SKATING: Winter ice skating is always hugely popular in London. 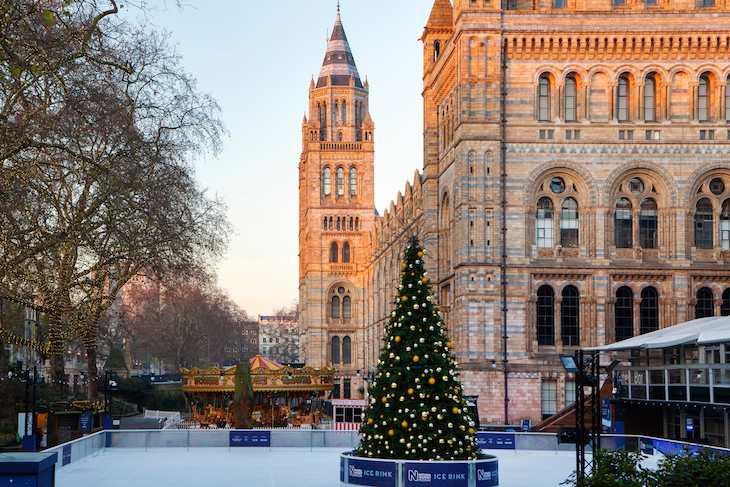 Pretty ice rinks pop up at places like the Natural History Museum, Canary Wharf, Somerset House and Hampton Court Palace from October right through until February. Here's our guide to where to get your skates on over Christmas 2018. There's even a rink at the former BBC Television Centre. SANTA'S GROTTO: The kids can share their Christmas wishes (and perhaps find out if they're on the Naughty or Nice list) at these Santa's Grottos and Father Christmas appearances around the capital. Most book out well in advance, so plan ahead. 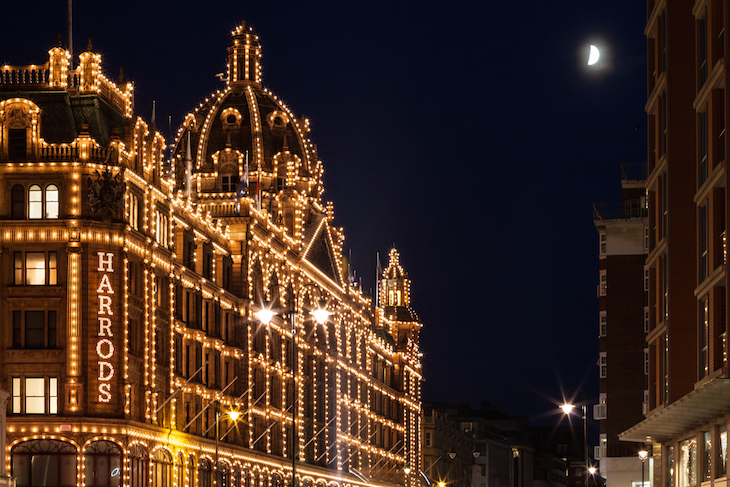 Do spare a thought for those elves though — here's what it's like working at the Harrods grotto. ENCHANTED ELTHAM 2018: Enchanted Eltham Palace is a winter lights trail, lighting up the beautiful grounds with fairy lights, to be enjoyed with a mince pie and mulled wine. WINTERVILLE 2018: Winterville is back on Clapham Common again (15 November-23 December), with funfair, ice rink, street food stalls, roller disco, crazy golf and more. 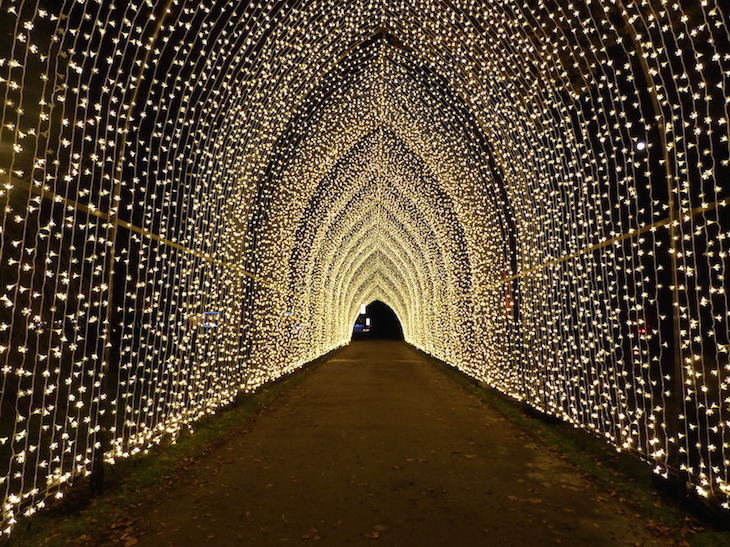 CHRISTMAS AT KEW 2018: Christmas At Kew is a twinkly light trail, winding through Kew Gardens after dark. As well as the lights — which are always stunning — there are food stalls and Victorian funfair rides. You need to book in advance. CHRISTMAS AT LONDON ZOO: 2018 is the first time the team behind Christmas at Kew have taken their expertise to London Zoo, creating a one-mile light trail among the zoo's grounds once the animals have gone to bed. If this floats your boat, find out about other winter lights festivals in London this Christmas. ALICE IN WINTERLAND: New for 2018, this lantern festival (28 November-5 January) takes over Southwark Park with larger than life lantern versions of characters and scenes from Alice in Wonderland — plus there's a Mad Hatter's tea party and a chance to see Father Christmas. ENCHANTED WOODLAND: Syon Park's Enchanted Woodland (9-25 November 2018) will be illuminated once again with colourful lights, all situated around an ornamental lake, and inside the historic arboretum. CHRISTMAS COMEDY: Have a laugh at our pick of festive comedy shows in London. FESTIVE EVENTS NEAR LONDON: We love London, but sometimes we see something so good, we have to leave the capital for a while. These events are near enough to London to warrant a day trip, and look well worth it. See also: Christmas things to do in Kent. BAH HUMBUG: If you want to avoid Christmas entirely — even if just for a day — take a look at these non-Christmassy things to do in London in December. 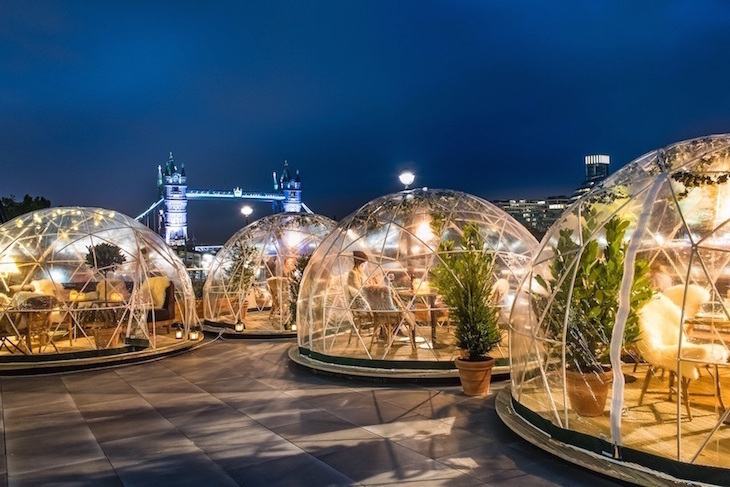 WINTER IGLOOS: Eat and drink in one of London's pop-up winter igloos. They're appearing on rooftops and by the river — and everyone's favourites, the Coppa Club igloos will be back, right next to the Thames. GINGERBREAD HOUSE: If igloos aren't your thing, why not hire your own gingerbread house style cabin instead? It's the stuff fairytale dreams are made of, and it's got us all festive just thinking about it. HOT CHOCOLATE: Whether you're ice skating, carolling or Christmas shopping, warm up with one of London's best hot chocolates... or enjoy the luxury of one of the capital's most decadent hot chocolates. SNOW IS FALLING: As if London hasn't had enough snow in 2018, this restaurant is promising (fake) snowfall five times a day throughout December. Get booked in now to slash the odds on a White Christmas. WEIRD CHRISTMAS FOOD: From Christmas burgers to battered Brussels sprouts and mince pie samosas, familiarise yourself with the weirdest festive food and drink in London this year. PUB CRAWL: Far be it from us to suggest you drink to excess, but if you are planning a pub crawl, might we suggest this 12 Days of Christmas pub crawl. It's geographically questionable but does have a pub for every line of the song. OUTDOOR DRINKING: Take the party outside with London's best winter drinking pop-ups and cosy bars — plenty of heaters, blankets and warm cocktails will keep you toasty. ALCOHOL-FREE: Don't drink? Fear not, we've got booze-free Christmas covered too. WINTER WARMERS: If you just want something to stave off the cold, read our guide to warming winter food — from melted cheese to hot chocolates, and full roast dinners, it's all in there. Christmas Day can be a magical time to explore the capital if you get up early enough. After about 11am there's a surprising amount of people about and more and more pubs and restaurants open each year. It's still a special day in the city however. No tubes, buses or trams will be running but if you can get into town by walking, cycle hire, taxi or your own transport, here are some of the things going on. Here's our complete guide of things to do in London on Christmas Day 2018, and if it's Christmas Dinner you're after, these places are serving it up — although you'll have to book in advance. An increasing number of central London cafes, pubs and restaurants open on Christmas Day but the decision to do so can be last minute — here's what we know will be open on Christmas Day in London. Once the big day is out of the way, we've still got you covered. Here's what's on on Boxing Day 2018, and we've also handpicked some events to keep you out of mischief right through to New Year. It's never too early to make your New Year's Eve plans — plenty of parties and events sell out months in advance. Here's our guide to this year's New Year's Eve events. It contains daytime events and parties that go on well into the night to see in 2019 with a bang. Ease yourself back into everyday life with our guide to things to do on New Year's Day. We've put together a special guide to the New Year's Day Parade, which takes place in central London every year. Get in the mood with these gorgeous festive photos of Christmas 2018 in London and this lovely time-lapse video by Mattia Biacci. 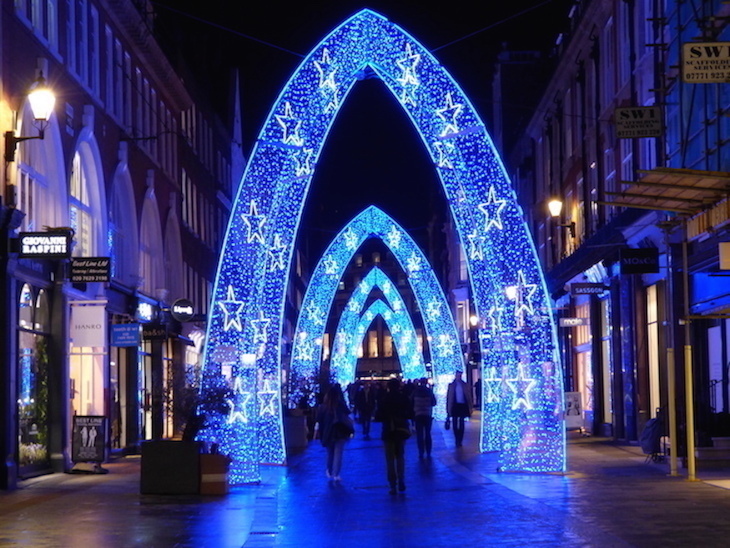 Keep up to date with the latest news, reviews, articles and features about Christmas in London.